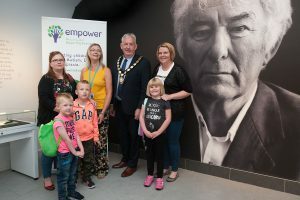 Empower Project, in partnership with the award winning Seamus Heaney Homeplace in Bellaghy, has introduced yet another innovative activity to its already busy programme of events. The Lottery funded project, which offers support to families of children with Autism, Dyslexia and Dyspraxia in the Mid Ulster and Antrim & Newtownabbey council areas, hosted a very successful movie day in the Centre’s Helicon last weekend. The Empower Project is managed by Northern Regional College with local community group Dyslexia and Dyspraxia Support (DADS) as the lead partner. It is supported by a steering group which incorporates: Northern Regional College, Magherafelt Learning Partnership, Mid Ulster District Council, CWSAN (Cookstown & Western Shores Area Network), Moving Forward Together (MFT), Stars – Autism support group, Education Authority, Magherafelt & Cookstown Volunteer Centre, CYPSP (Children & Young People’s Strategic Partnership). This entry was posted in Midulster LPG, News, northern-og and tagged Midulster_lpg, news/events, northern-og by Michael. Bookmark the permalink.